MGM. 85 minutes. US release: 10/4/35. DVD on-demand release from Warner Archive Collection: 3/4/14. 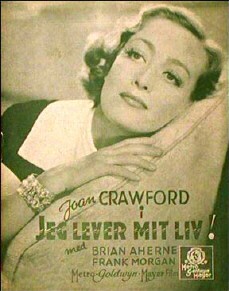 Cast: Joan Crawford (as "Kay"), Brian Aherne, Frank Morgan, Aline MacMahon, Eric Blore, Fred Keating, Jessie Ralph, Arthur Treacher, Hedda Hopper, Frank Conroy, Etienne Girardot, Edward Brophy, Sterling Holloway, Hilda Vaughn, Vince Barnett, Lionel Stander, Hale Hamilton. Credits: Based on the story "Claustrophobia" by A. Carter Goodloe. Screenplay: Joseph L. Mankiewicz. Producer: Bernard H. Hyman. Director: W.S. Van Dyke. Camera: George Folsey. Costumes: Adrian. Editor: Tom Held. Score: Dimitri Tiomkin. The story upon which the film was based, "Claustrophobia" by A. Carter Goodloe, first appeared in Scribner's in April 1926. 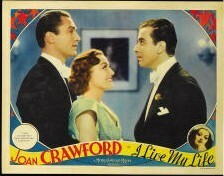 The film was in production from 6/3/35 to 7/35. Filmed at Chatsworth, Los Angeles, and the Santa Catalina and Channel Islands of California. Working titles of the film included If You Love Me, Elegance, and Glitter. 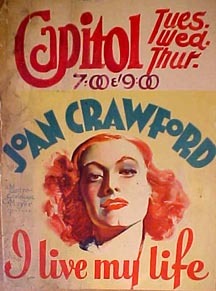 Originally Miss Crawford's new film at the Capitol Theatre took its title from claustrophobia, that dread theatrical disease which sometimes overcomes movie audiences in the contemplation of excessively bogus society romances. Now it is called "I Live My Life" and proves to be an entertaining effort to show that love is really a pretty democratic emotion, although gowns by Adrian have their definite value in stimulating it. 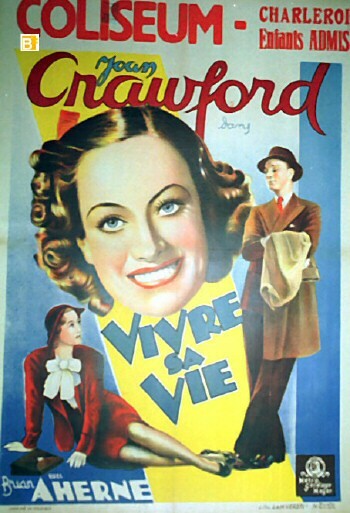 I have always suffered from myopia when it came to Miss Crawford's glamorous contributions to cinema art, but this time the distinguished glitter girl enjoys the help of W. S. Van Dyke's lively production and some uncommonly hilarious actors. 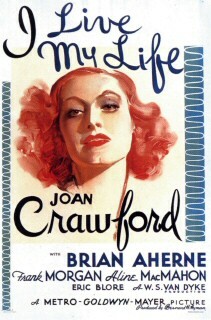 The film engulfs Miss Crawford in her usual plight, suffocating the poor girl with money and hedging her around with society credos so that she has difficulty finding real happiness. During one of her pleasure trips she engages in a kiss-and-run episode with Brian Aherne, an ardent archaeologist, who, in his old-fashioned way, believes that a caress is the equivalent of a marriage bargain. So he leaves his Grecian ruins and follows her back to New York, where he shocks her exclusive friends by his comments on the degenerate lives they lead. 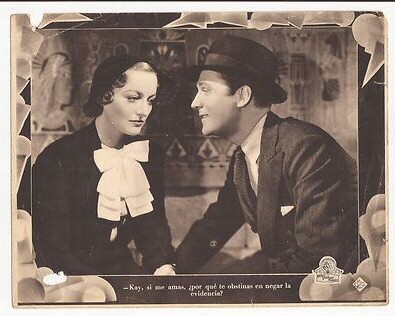 Miss Crawford insists that she is doomed to go through life as a millionaire parasite, having been born to that unhappy life, but Mr. Aherne convinces her that she can escape into the merrier world of the common people if she only will try. 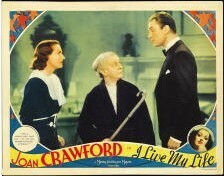 Apparently the authors of "I Live My Life" grew doubtful about the joys of poverty before the film was completed, because they rescue Miss Crawford at the last minute from love on the dole. Thus the matriarch who rules the family takes an unexpected liking to the rebellious commoner and approves his alliance with her gently nurtured granddaughter. 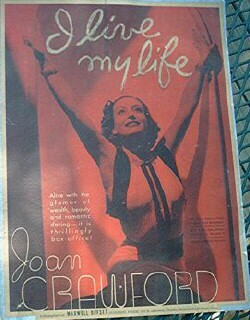 Even then Miss Crawford wins her man only by tricking him into matrimony in a way that the Alimony Club would scarcely regard as cricket. After a quarrel on the eve of their wedding they call the marriage off, but Mr. Aherne agrees to show up at the church so that he may play the jilted suitor and spare the girl embarrassment. But Miss Crawford violates the pact by appearing at the church, thereby forcing her reluctant lover to go through with it. 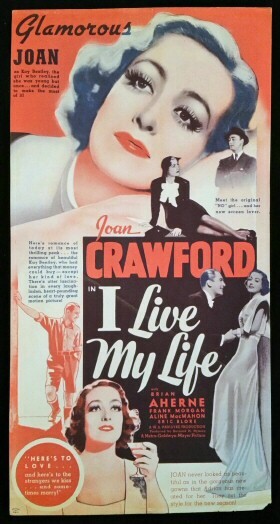 In the interests of realism there really ought to be a sequel to "I Live My Life," examining the marital career of these curiously mismated lovers. It might be entitled "Oh, Yeah?" Miss Crawford is rather self-consciously adequate to the needs of her part and Mr. Aherne is excellent as the dashing scientist. Frank Morgan, who could not play straight if he tried, is superbly comic as the heroine's distressed father. Jessie Ralph, as the tyrannical head of the family, proves again that she is the best of the screen grandmothers. The photoplay also possesses the two funniest butlers in Hollywood, Eric Blore and Arthur Treacher, and even allows them a bit of acrimonious rivalry in one scene. 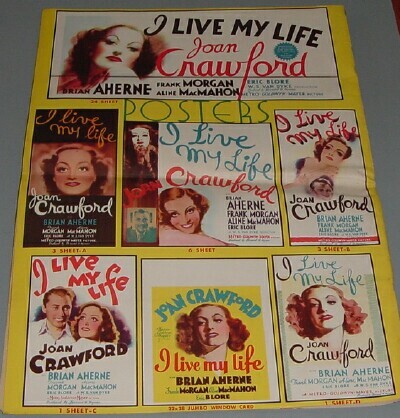 I Live My Life contains all the ingredients, and to good measure, for a conventional Joan Crawford picture. An amusing romance [from a story by A. Carter Goodloe] is backgrounded by clothes, cocktails and butlers. The premise, as is customary with Crawford operas, is that the rich are not as good as the poor, only in this instance Crawford is on the coin side and it takes a man to trim her down. The man is an archaeologist who follows the girl from Greece to New York. They get along like a pair of wrasslers, always appearing to be fighting but loving each other down deep just the same. Cast is studded with sturdy players who know their stuff and the reason for much of the merriment can be found in the supporting troupe. 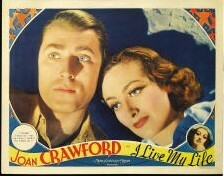 Brian Aherne is aces opposite Crawford. 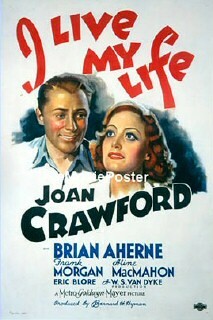 His flamboyant Irishman in this film is vigorous, colorful trouping. Crawford won’t disappoint from a sartorial angle. On performance she’s also as usual, but if her eyelashes continue getting any longer her leading men will have to start wearing bumpers. [The picture] has something of the vitality that W.S. Van Dyke, its director, invariably gets into his works, but it is a pretty routine bit of story telling. If, however, you're an enthusiast for the regulation type of Crawford vehicle, you may find the work soul-satisfying. The star plays handsomely and competently. 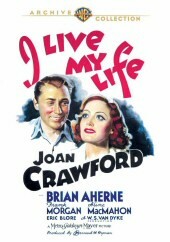 If you've seen I Live My Life and would like to share your review here, please e-mail me. Feel free to include a photo of yourself; a star-rating, with 5 stars the best; and any of your favorite lines from the film. When I want something with flair and an easy blend of sophistication, I choose this harmless and actually well-done comedy. 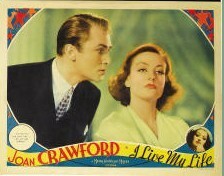 A change of pace for me, a change of pace for Miss Crawford. I like to see a young Joan bouncing around on the screen. I am very glad she has given me so many choices for my movie moods. When I want her young, vivacious, and candid, I seek out a movie like this. Because of the expert and often effortless direction of W.S. 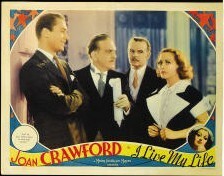 VanDyke, Miss Crawford’s comedy performance is as good as the French lady and as carefree as Irene Dunne or the other comedic gals. It is a shame that comedic performances like these are forgotten or never drawn upon and reexamined to consider Miss Crawford’s wide range. It’s wide and she gives us a glowing portrayal. Remember, this is entertainment! Mr. Brian Aherne and Miss Crawford share that old love/hate romance, with the right amount of home-spun feeling and chemistry. Mr. Aherne is a swarthy chap here. (I would go dig some holes with him!) 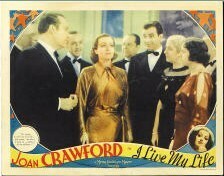 He finally breaks Miss Crawford down, as well as some of the tedious moments of the script. They then take us on a free-flying journey, or as far as the censors will let them. The number one reason I am satisfied with this film is because of one person… Mr. Frank Morgan, teamed here for the first time with Miss Crawford, is absolutely the best in the business and the best thing in the movie. Reason number two would be Eric Blore: He steals scenes in a good way (by adding to them); he just has to roll his eyes or give a look and he is fabulous. His voice is aligned with the English-butler school of comedy and drama. Only he can say those lines. If Hattie McDaniel had to play a maid, he always played a butler. I can watch him anytime; he has bits of side comedy with another wonderful man andbutler, Arthur Treacher. Expertly funny together. Aline MacMahon is a face I always love to see, even as a Chinese character in Jade, with Miss Katharine Hepburn. She is a strong comedian and can throw out a comedic line like you throw out the trash. Edward Brophy: Look for him palling around with the “Thin Man” -- a great wisecracker, and he snarls out his lines like he’s in a dumpster. Lionel Stander, identified by his raspy voice, is still a novice and only gets the back of his head in camera range during a card-game scene, but in two years he gets the role of “Libby” in 1937's A Star Is Born -- then you will never forget him. My thanks to MGM for having these folks around: Sterling Holloway, Hale Hamilton, and Hedda Hopper claiming her piece of Hollywood history (be nice okay!?). 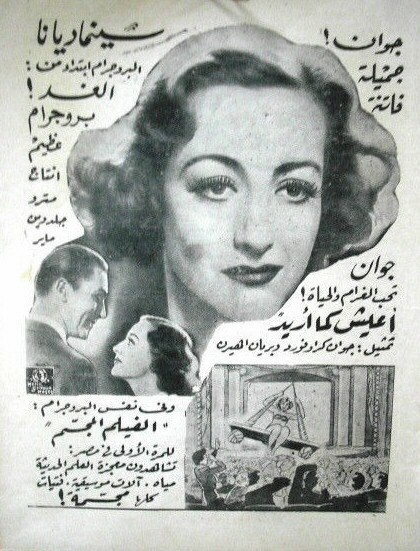 With the usual production values of MGM, and Mr. Mankiewicz getting acquainted with Miss Crawford and getting used to “one shot woody,” he puts together a fun show. Enjoy yourself. 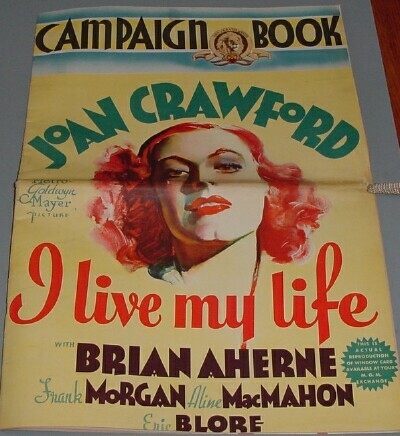 Joan was going through a lapse of mediocrity when she made "I Live My Life." Also having made the unspectacular but marginally entertaining "No More Ladies," this film was a step in the same direction. 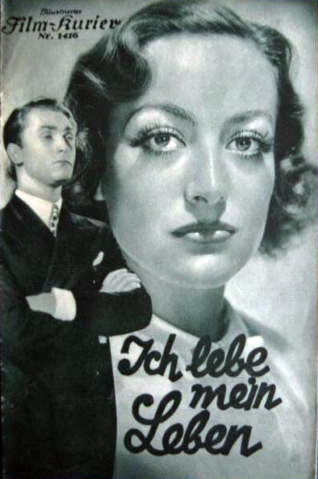 The film does have numerous assets, however, including adequate performances by the leads Joan Crawford and Brian Aherne. 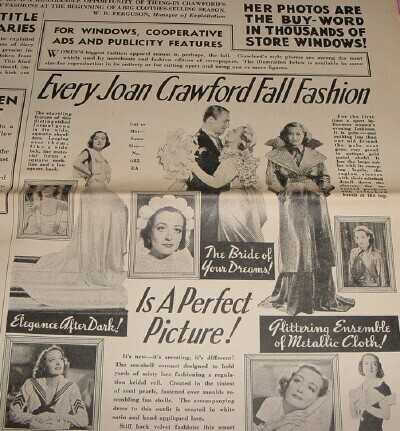 Joan, in particular, is very appealing throughout, if not always up to the comedic challenges. She gives it a worthy effort, though, as always. Aherne seems less comfortable in a screwball comedy, almost serious at times, but overall his attractiveness wins. The rest of the cast is glittering as well, with supporting roles played exceedingly well by the likes of Jessie Ralph and Frank Morgan. MGM went all out with the production values here and the result is a glossiness typical of the studio. 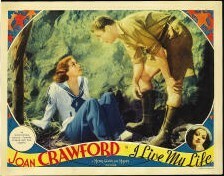 The early scenes are the most effective, chronicling the romantic adventures of Joan's character on an island. The plot is typical fluff, little worth mentioning except the intelligent and spirited romance in some of the early scenes. 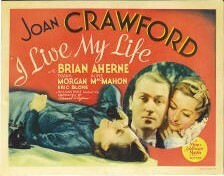 One of these scenes occurs when Aherne travels to New York to meet up with Crawford and she explains to him "she can't change the way she is," which in turn he replies in terms of her weakness for not trying to change. It is an intelligent scene, but sadly the rest of the film soon becomes overwhelmed by the forced comedic situations and the miscasting of the lead players. The film does work well as a Crawford star vehicle, however. She is in top form and as youthfully glamorous as ever. Crawford's appeal alone can not save the film from the weight of too many clichés and the overall tiredness of the plot elements. We've seen it all before. It should be noted that, although the film as a whole is not entirely effective, the first half is remarkably good, with some cute moments which point to the overall potential of the film. 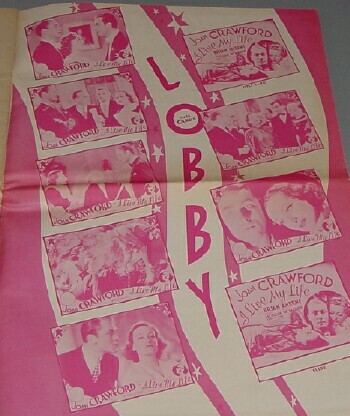 Above: US lobby cards. 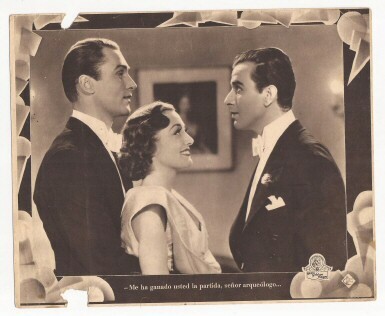 Below: Lobby cards from Spain. Above: A Danish program, a US herald, and a German program. 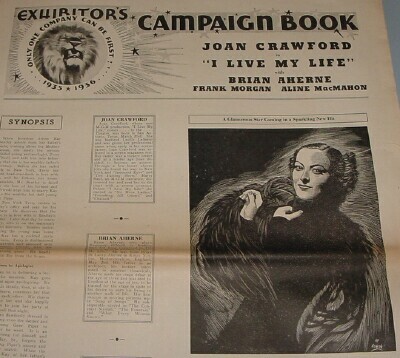 Above: Pages from the "I Live My Life" US campaign book.